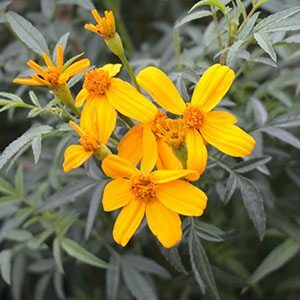 Commonly known as the ‘Mexican Marigold’, Tagetes lemmonii is another plant that doubles up with interesting foliage as well as flowers. It is also drought tolerant, easy to prune and attracts Bees and Butterflies to the garden. The foliage is fragrant when brushed against or crushed. Reaching around 1 – 2 m in height with fine textured bright green scented foliage Tagetes lemmonii adds texture to the garden in summer and then the masses of flowers in autumn are a real treat. The real beauty of this plant is that it will flower from late summer right through autumn into winter. An excellent addition to the cottage garden. Try pruning lightly after the main flush of flowers is over, you may be rewarded with a second lot of flowers later in spring. A sunny position in a well drained humus rich soil is best, good drainage is essential and Tagetes lemmonii is a good choice for that ‘hot spot’ in the garden border. Prune back any damaged foliage in late winter before new growth commences, prune top shape after flowering. Spread – Will grow to around 1 metre. Foliage – Deep green and fragrant.